Maybe you want protection for your phone, but don’t want to shell out $40 for a high-end case? 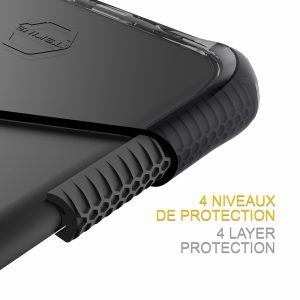 ITSKINS is a company based in China, and run by a French man that offers protection for various phones. Today we are reviewing 3 levels of cases- ZeroGel(Level 1), Spectrum(Level 2), and Supreme(Level 3). Starting off with the ZeroGel, these translucent cases are offered in a variety of colors like the above clear case, pink, black, purple, and various colors of blue. They are nice and thin, but still offer great protection- drop certified at 1 meter/3.3 feet. This one is the basic, ultra slim design. The case is flexible, with raised edges to protect the front of the phone if it is set on its screen side. It has the shock absorbing design that looks like honeycomb. This style of case is listed at a price of $17.99 USD on the ITSKINS website. For a couple of dollars more ($19.99 USD), you can upgrade to a Spectrum case, which looks similar to the slim protection, but is Drop Safe up to 2 Meters. The case we received to review fits the iPhone X, and came in a translucent black color, but you can find them for many types of phones in several different colors. You can find the one for your phone here. 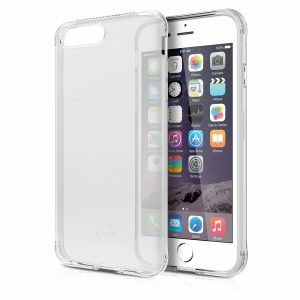 Finally, at least for this review, you can get the level 3 protection of the Supreme case. This one runs a bit more at $29.99, but offers even more protection with a droptest level of up to 3 meters! There are other level 3 cases available from ITSKINS, but this one is the slimmest. As you can see in the image, there’s a 4 layer protection going on. These 3 levels of cases were sent to us to review for free in exchange for a fair and unbiased review on our site.